Our boat becomes yours as we snorkel with sea turtles, fish for big game, high-dive off the top deck and host you until your heart's content. We're here to host the best day of your vacation, all you need to do is arrive. Don't take it from us... Our guests are the only proof you need. With our private yacht charters the day is yours. For however long you want to cruise the Mayan Riviera coastline, we'll be here to accommodate you and your guests. Unlimited national open bar (vodka, tequila, whiskey, rum, Carta Blanca beer). Deluxe open bar available as an add-on, see below. You can mix and match the below add-ons depending on your needs as well as those of your guests. Some may want the cigar and scotch option, while many will be happy with Deluxe. Non-stop, unlimited open bar. The Deluxe bar includes top shelf liquor like Absolut Vodka, Jose Cuervo Tequila, Captain Morgan's Rum, piña coladas, margaritas, strawberry and mango daiquiris, shots, beer, juices, soda and water. When you arrive at the dock we have rum or vodka punch ready, and the service doesn't stop until the tour is over. No commitment is required to begin selecting dates within the calendar and all tours have a 100% guaranteed foul weather refund. Any other special requests? Let us know and we'll make it happen. A private charter is $1775usd for 4 hours and includes 15 complimentary guests. $500 for each additional hour. Open bar add-ons can be seen listed above. With us, what you see is exactly what you get. With private tours we have scheduled times of 9:00am, 1:30pm or 6:30pm. If those don't suit your schedule, just let us know. Whether you want sunrise, sunset, all-night or anything between, our job is to accommodate you. Your yacht will depart from the marina at Puerto Aventuras, about 20 minutes from Playa del Carmen. Optional round trip transportation in very comfortable, air-conditioned vans from anywhere in the Mayan Riviera is only $15 per guest (Or $20 from the Cancun Hotel Zone and Tulum). This is a wholesale rate we have worked out with a transportation company for you. We simply want to provide the most cost-effective transport to the boat. Add deluxe liquor to your tour for a small extra fee. You have options of open bar for the entire tour or a select number of bottles. Click here for our bottle list and open bar pricing. Every tour comes with fire roasted chicken, freshly made guacamole, fresh diced salsa, Mexican style rice, beans, tortillas and tortilla chips. The lunch can be enjoyed as a plated dish or you can mix the ingredients to create delicious tacos!. Everything is prepared per-charter, fresh as can be! Thinking this all sounds pretty good? Send us a quick email. No obligations, no high-pressure sales tactics, just exceptional customer service and speedy replies. Even better than email: That little chat box bubble in the bottom corner of the page will get you right in touch with us in a live chat, or if we're out for tacos, alert us to respond to you with an email as soon as possible. "The best thing we did in Mexico..."
"Our yacht cruise was by far the best thing we did during our entire vacation in Mexico. We would strongly recommend to anyone that they spend a little time with Mack his crew on H2oh Sun Cruises." — Richard M, Trip Advisor. Snorkel a beautiful reef just south of Playa del Carmen! All snorkel gear and life jackets will be provided. All you need to do is get in the water and be prepared to see hundreds of unique tropical reef fish and turtles. While we aren't a dedicated sport fishing charter, we do have some rods and lines we put in the water on every trip to the reef. This is more "entertainment fishing" than sport fishing. Every once in awhile, when in season we'll catch dorado, barracuda, some little tunas and wahoo. Fishing season is typically late April or early May through September and a little bit of October. With our 6,000 watt sound system, you're going to really enjoy your favorite music. We have a library full of songs, we can connect your device or even download a song for you while at sea. Also, any time on Piratas de Tejas is karaoke time. All you need to do is say when and we'll hand you the mic and turn it up. We have a huge catalog of songs. How many of your friends back home can say they belted out their favorites singing karaoke while cruising the Caribbean? Interested in a deluxe bar upgrade or bottle service? Click here to see our deluxe liquor selection. 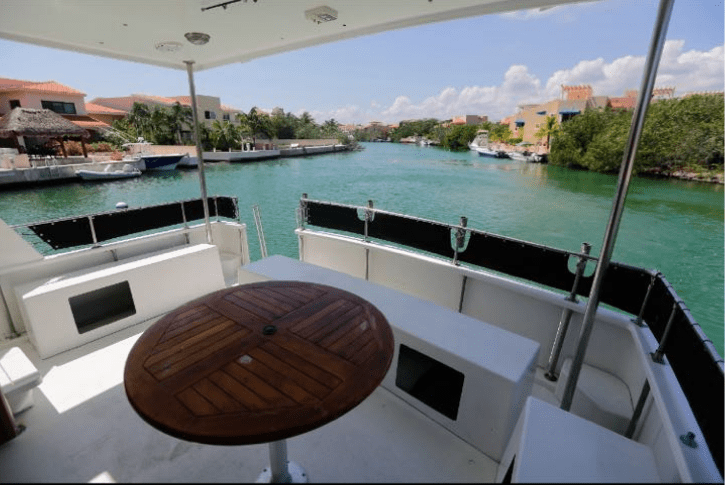 To wind down the tour we take you through the incredible private canals of Puerto Aventuras. You'll get to relax as we coast through the calmest waters alongside beautiful homes while you eat and drink and realize just how good life is! This is for all tours four hours and longer. We have a built in dive platform off the second level of our yacht. Jump off and into the warm Caribbean waters below. You've seen all these different activities you can get up to while on your yacht tour, but sometimes you just want to sit back and relax with an ice cold drink. Well, there's plenty of space for that on our 72' yacht. You can do however much or however little you'd like, the boat is your home for the day! No commitment is required to begin selecting dates within the calendar. All tours have a 100% bad weather refund.